Sen. Patrick Leahy questions Judge Neil Gorsuch before the Senate Judiciary Committee on Tuesday. U.S. Supreme Court nomination hearings are a tightly choreographed dance. Members of the Senate Judiciary Committee deliver lengthy orations with questions dangling precariously at the end, and nominees try their best not to say anything that might reveal the slightest hint of an opinion. Sen. Patrick Leahy (D-Vt.) has performed this dance more than probably any other human being who’s ever walked the earth, as the Senate’s longest currently serving member and the senior Democrat on the Judiciary Committee. On Tuesday, he took a new partner for a spin: Appellate Court Judge Neil Gorsuch, President Donald Trump’s first Supreme Court nominee. It was the second day of Gorsuch’s confirmation hearings but the first time the nominee was questioned under oath. As in a dance, each partner plays a well-rehearsed role and is fully aware of the other’s moves. The one big difference: Astaire tries to step on his partner’s toes and provoke a reaction, while Rogers’ face maintains a resolute smile. 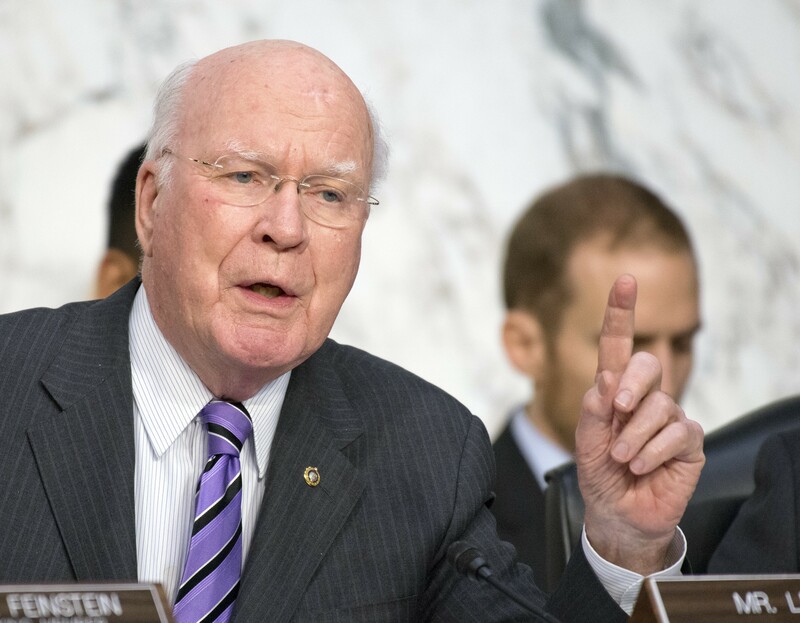 At Tuesday’s hearing, Leahy sometimes provoked a visible clench from the witness and a response best described as obsequious condescension. Gorsuch isn’t quite a skilled enough Rogers to completely hide his political differences with Leahy and his impatience with the senator’s tactics. Leahy began by recapping the sordid history of the court vacancy: The seat was opened with the death of justice Antonin Scalia more than a year ago, and resolutely preserved by the Senate’s Republican majority. Leahy pointed out that Gorsuch had expressed admiration for Appellate Court Judge Merrick Garland, former president Barack Obama’s never-considered nominee. But Gorsuch refused to answer Leahy’s question about whether Garland was treated fairly. That was the theme of the day, as Gorsuch did his best to evade every inquiry Leahy tossed his way. Good line, but Gorsuch didn’t take the bait. “I think what they listened to was the fact that they’d seen me in action,” he replied. There were some contentious exchanges, as Leahy sought to pin down Gorsuch and the nominee squirted away. There was a lengthy, inconclusive colloquy on the Citizens United decision that barred many restrictions on campaign donations. Leahy quizzed Gorsuch on whether the Constitution said anything about corporate contributions. Leahy: But nothing in the Federalist Papers that talked about corporate money going into campaigns, is that correct? Leahy: That’s an easy yes or no. 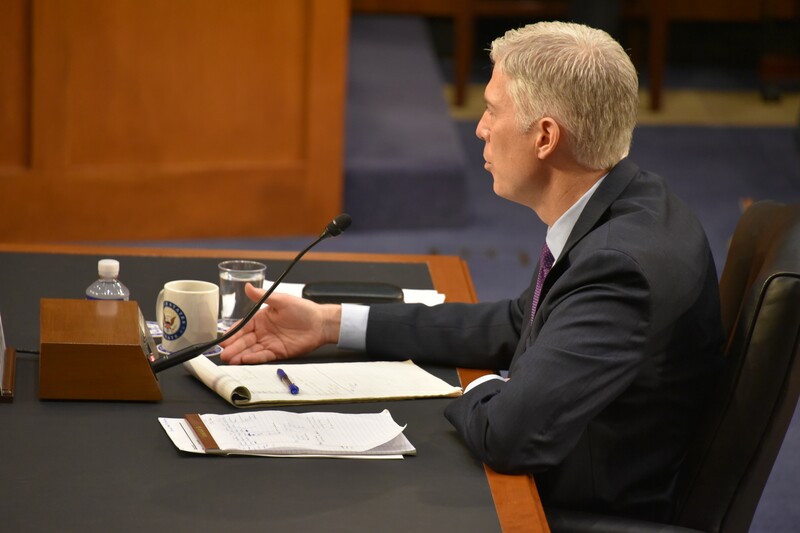 Gorsuch: I, I, I think there’s an awful lot in the Federalist Papers and elsewhere that were relevant to and considered by both concurrences and dissents in Citizens United. Leahy: But nothing about corporate money. Gorsuch: I, I don’t remember that term, no, Senator. Leahy: Trust me, there wasn’t. Leahy: No, you don’t have to. Leahy moved on to the influence of money in politics, asking if there wasn’t something inherently corrupting about a corporation donating “unlimited amounts of money.” Gorsuch resisted — to the point of absurdity. Leahy: If somebody were to out and out buy a vote, we’d all agree that’s corruption, is it not? Gorsuch: I think [Supreme Court] Justice [Anthony] Kennedy would agree with you, yes. Leahy: Would you agree with me? Gorsuch: I follow the law. And that would certainly follow my understanding of the law. Leahy kept up the pace, and Gorsuch evaded nimbly. Leahy tried to get the judge to agree that members of a religious group should not be prohibited from entering the United States or serving in the military, and whether a president’s powers would supersede a congressional prohibition against torture or warrantless wiretapping. How quaint. Biscuits in the oven, ladies. Leahy then sought Gorsuch’s views on recent Supreme Court decisions limiting class action lawsuits and the scope of the Voting Rights Act. Leahy argued that in past hearings Supreme Court nominees had been willing to address previous cases. But Gorsuch claimed that, although those cases had been decided, they might come before the Court anew, so it would be improper for him to comment. And then Leahy’s designated half hour expired. He got the nominee sweating, but never knocked him off balance. Not surprising. High court nominees read, study and practice for these occasions. Their ascent to the nation’s highest court depends on their agility under tough questioning. The hearing will continue Wednesday, with Leahy and his 19 colleagues getting another shot at the nominee. Expect more of the same.